Patek Philippe has made hundreds of different models of watches since their inception in 1839. The 5004 is in the top 5 for collectability. It is simply a wristwatch for which there is considerably more collector interest in, than there are 5004s in existence. This 5004 is a piece unique with its 18k white gold case with black dial and removable 18k white gold Patek bracelet. Watch is complete with Patek box and papers. 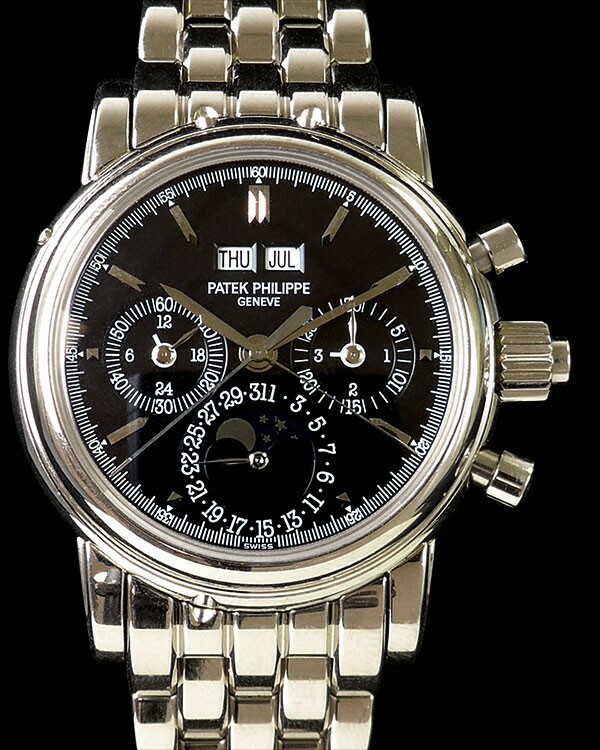 The Patek Philippe reference 5004 features a split-seconds chronograph (also known as rattrapante or double chronograph) paired with a perpetual calendar and moonphase complication. These are two of the most prestigious complications that a watch can have, but building on that, the 5004 achieves a rare gestalt, where the sum of the parts exceeds the individual components. The watch case is just perfect in its lines and massive proportions. The black dial looks so good it will make your brain hurt. 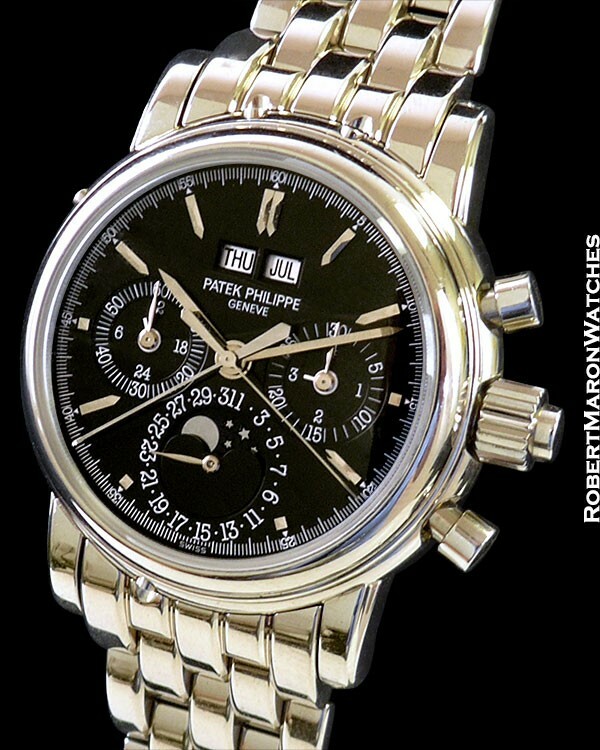 No wonder this is one of Patek Philippe's most treasured watches. 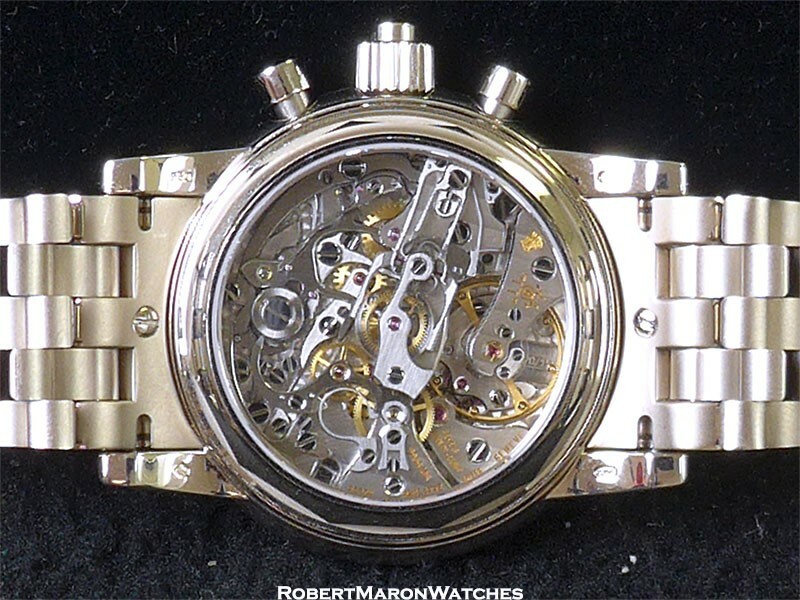 Case is 18k white gold and is 37mm in diameter and 15mm thick. Front and display back sapphire crystals. Chronograph split seconds button is embedded in the winding crown. Pump style chronograph pushers. The lugs are stepped and undiminished from polishing. Normally, a 5004G will have a silver dial. The black dial on this watch is striking and unique! The day and month are shown in the apertures below 12 o'clock; the 3 o'clock subdial displays the leap year cycle and chronograph 30 minute totalizer; 6 o'clock subdial displays the moonphase and date; 9 o'clock subdial displays constant seconds and 24 hour time. Watch is like new and complete with Patek box and papers.